« Plum Rootstock Junction: is there any problem? Growing Apple Trees on their own Roots? I was wondering if anyone here can help me out with some advice please! I’m trying to grow some apples on their own roots. Sometimes I read that if you plant the tree deeply, so that the graft union is below the soil, then the scion will root and you will, in time, have a tree that is growing on its own roots. In other places I have read that if you plant the tree too deeply it will die. I would be very grateful to hear which is correct, or any ideas or experience anyone has on how to get the scion to root. I believe that the late Hugh Ermen did some research on this subject, referring to them as ‘piggy-back trees’, but have no further knowledge of this research. Perhaps someone else knows more about his work on this? I have seen a number of trees in commercial orchards that have become ‘scion-rooted’ because the union was buried, or set very close to the ground. 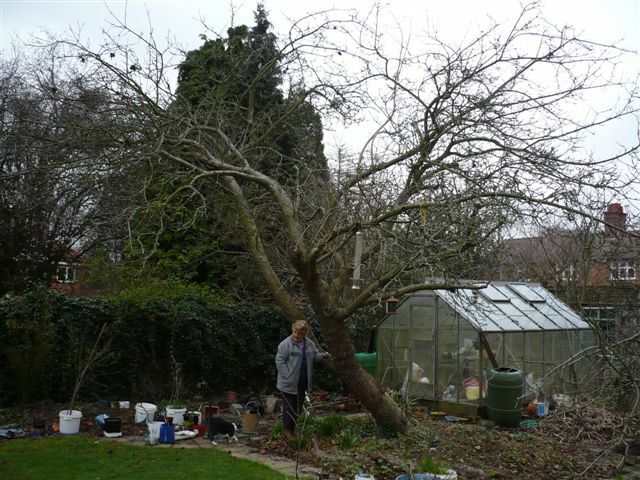 This used to be a particular problem in Bramley orchards on M9 or M26 rootstocks, If the Bramley scion was able to put out a root, the tree became huge and unmanageable. We used to try to kill the offending root by cutting out a segment close to the base of the trunk. This suggests that is would be possible to encourage scion rooting by putting the union close to, or just below, the soil level. I have no idea how deep below the original ‘planting line’ you have to go before you can kill the tree. I also have no idea if the size of the rootstock influences the formation of scion roots, but it would not surprise me if this was a contributing factor. It was once common practice in the old days when grafting apple onto seedling rootstock to mound up a layer around the graft union so the scion would root. It is discouraged nowadays as it could defeat the dwarfing properties of the rootstock and outgrow the smaller garden it is planted in, but no harm will come to the tree. There are a few ways to get a tree on its own roots: you could trail a low, thin branch to loop down in the soil, burying the middle of it so it roots, and then cut it off the next winter and plant it. Then there is the deep-planted method you mentioned. Some varieties might even air-layer by roughing up the bark on a branch, and covering it with a bag filled with damp soil and wrapping in aluminum foil. Finally there is meristem tissue culture, which requires quite the serious hobbyist to pursue due to the clean conditions required, but will produce many trees in a short time span. Once you do get a tree on its own roots you can use potted mound-layering to propagate more; plant a 1-year old tree in a pot and cut it off at soil level. Cut the bottom off another pot and place the ring on top of the first one and as the multiple resultant suckers grow, gradually fill it with sawdust or a mix of peat moss and perlite. On most varieties the suckers will root into the sawdust and at the end of the season, remove the ring, shake off the sawdust, and cut off the rooted suckers which become your new trees. I’m going to give a sort of ‘potted mound-layering’ a go. My thought is to cut off a young tree about a foot and half above the ground – so it will produce sappy fast growing sprouts – and then gradually cover these up as they grow using bottomless buckets and sawdust, as Kevin suggested. I’m hoping to eventually get some very large trees – I’ll be trying this with Blenheim Orange and Bramley! Your respondents are spot on. Hugh Ermen, formerly of the Ministry of Agriculture Fisheries & Food (MAAF) Experimental Station at Brogdale, had a bee in his bonnet about trees on their own roots being superior to those on orthodox stocks. Indeed my wife, after graduating at Wye College in the 1960s, did further research under (then) Dr Wilkinson (Wye College) and Dr Brian Howard (East Malling Research Station) and published her work for a higher degree. Malling bins were used to propagate cultivars from hardwood cuttings. She subsequently came to work with Hugh at Brogdale in her capacity as Plant Variety Rights Officer for MAAF, so they shared much in common. Hugh did plant out some useful material at Yalding Organic Garden in Kent. I will pursue information. Stephen Phillips might wish to see what a tree growing on its own roots looks like. The Bramley’s Seedling, shown, was put in by myself with, I now realise, the graft union too close to the surface. The tree was planted in 1966 and must have scion-rooted shortly afterwards. Until recently the canopy was considerably larger, for, as can be seen, the trunk is at a crazy angle, and several large branches were cut off in the hopes of stopping it leaning further. Apart from this the tree is perfectly healthy and most years bears a heavy crop. It has been ringed two to three times over the years when it showed signs of becoming biennial and the scar may be seen on the main trunk just above the first branch. It also has three small sprigs of mistletoe growing on it, but these are not visible in the photograph. I have no reason to suppose that the inclination to the bole may be laid at the fault of the roots. The tree grew at a bit of an angle to start with and it has just got worse over time. I am inclined to think a vigorous tree on its own roots – if you are prepared to stand back and let grow as it wishes – is better able to withstand the pests and diseases that nature flings at it than are its brethren growing on something else’s roots. There is also another matter. To my mind apples grown on a tree such as this differ sometimes from apples produced by grafted trees. They are not necessarily better – or worse – but they may differ, and, if so, presumably they as close as we can now get to the original of the variety in question. Jim: well, your Bramley tree has some things in common with the other original Bramley tree in Nottinghamshire; they’re both on their own roots, and both leaning badly! Actually, the original appears to have been blown over, but is still tooling merrily along. Maybe this is a fault with Bramley roots? Here in the desert I’ve come to value vigorous rootstocks on apples, just for the reason they’re drought-tolerant and able to outgrow all the things that are trying to kill them. We still use heated bins at East Malling Research to root scion. It is possible (if you try enough times with dormant 1st yr wood) to get most apple varieties to root with this method, but the ease of this is very much genotype-dependent. We have resorted to tissue culture for some particularly stubborn types. Look me up on the EMR website (www.emr.ac.uk) and I can send you a protocol- I don’t have it to hand at the moment. I have located Hugh Ermen’s original brochure on ‘Trees on their own roots’ (2000). I said I would keep on the case! I was very successful with air-layering a Jonagold, by splitting a branch, dusting it with #3 rooting powder, and wrapping it loosely with a plastic bag filled with damp, sterile soil. I secured it snugly with non-adhesive chip-budding tape. In the fall, I cut off the rooted twig. It produced a remarkable and precocious tree.